Saw this in the grocery store recently. 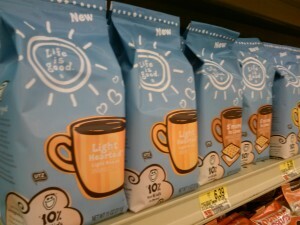 The Life is Good brand, mostly seen on T-Shirts, now has their own unique coffee! The roasts have ‘cute’ names such as: Happy Medium, Light Hearted, Dark and Daring, Smore to Love, and Banana Bread Bliss. Not sure if that last one tastes like bananas, or just goes well with the bread. We didn’t see K Cups of this, but we are sure they are on their way!